This article is about the term for thick fog or smog. For the soup made from peas, see Pea soup. 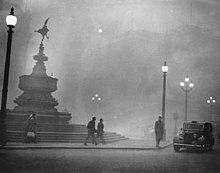 Piccadilly Circus in Pea-Soup Fog, 1952, by John Hampton. Pea soup fog (also known as a pea souper, black fog or killer fog) is a very thick and often yellowish, greenish, or blackish fog caused by air pollution that contains soot particulates and the poisonous gas sulphur dioxide. This very thick smog occurs in cities and is derived from the smoke given off by the burning of soft coal for home heating and in industrial processes. Smog of this intensity is often lethal to vulnerable people such as the elderly, the very young and those with respiratory problems. The result of these phenomena was commonly known as a London particular or London fog; in a reversal of the idiom, "London particular" became the name for a thick pea and ham soup. From as early as the 1200s, air pollution became increasingly prevalent, and a predominant perception in the 13th century was that sea-coal smoke would affect one's health. From the mid-1600s, in U.K. cities, especially London, the incidence of ill-health was attributed to coal smoke from both domestic and industrial chimneys combining with the mists and fogs of the Thames Valley. Luke Howard, a pioneer in urban climate studies, published The Climate of London in 1818–20, in which he uses the term 'city fog' and describes the heat island effect which concentrated the accumulation of smog over the city. In 1880 Francis Albert Rollo Russell, son of the former Prime Minister Lord John Russell, published a leaflet that blamed home hearth smoke, rather than factories' smoke, for damaging the city’s important buildings, depriving vegetation of sunlight, and increasing the expense and effort of laundering clothes. Furthermore, he charged the ‘perpetually present’ sulphurous smoke with increasing bronchitis and other respiratory diseases. More than 2,000 Londoners had ‘literally choked to death’, he wrote, on account of ‘a want of carefulness in preventing smoke in our domestic fires’ which emitted coal smoke from ‘more than a million chimneys’ that when combined with the prolonged fogs of late January and early February 1880, fatally aggravated pre-existing lung conditions and was ‘more fatal than the slaughter of many a great battle’. The most lethal incidence of this smog in London occurred in 1952 and resulted in the Clean Air Act 1956 and Clean Air Act 1968, both now repealed and consolidated into the Clean Air Act 1993 which were effective in largely removing sulphur dioxide and coal smoke, the causes of pea soup fog, though these have been replaced by less visible pollutants that derive from vehicles in urban areas. An 1871 New York Times article refers to "London, particularly, where the population are periodically submerged in a fog of the consistency of pea soup..." The fogs caused large numbers of deaths from respiratory problems. King Edward I of England banned the burning of sea-coal by proclamation in London in 1272, after its smoke became a problem. By the 17th century London's pollution had become a serious problem, still due, in particular, to the burning of cheap, readily available sea coal. John Evelyn, advisor to King Charles II, defined the problem in his pamphlet, Fumifugium: Or, the Inconvenience of the Aer, and Smoake of London Dissipated published in 1661, blaming coal, a "subterrany fuel" that had "a kind of virulent or arsenical vapour arising from it" for killing many. He proposed the relocation of industry out of the city and the planting of massive gardens of "odiferous flowers" to "tinge the air" and thus mask the pollution. The worst recorded instance was the Great Smog of 1952, when 4,000 deaths were reported in the city over a couple of days, and a subsequent 8,000 related deaths, leading to the passage of the Clean Air Act 1956, which banned the use of coal for domestic fires in some urban areas. The overall death toll from that incident is now believed to be around 12,000. In Chapter XXXIV of Thomas Love Peacock's Melincourt (1817), the Reverend Mr. Portpipe tells his visitors that he has "good ale and a few bottles of London Particular." A footnote by David Garnett, editor of the 1948 edition, explains that this is "a Madeira wine imported for the London market and hence, from its colour, a London fog." A second appears in 1839; "It was not, therefore, until he had left Italy, that Lord Cheveley felt his utter wretchedness and desolation: and London in December was not calculated to lessen it, as it only presents a pea-soup fog, which renders the necessary and natural process of respiration, almost what Dr. Johnson's idea of fine music ought to be, impossible! ", in Lytton, Rosina Bulwer Lytton Baroness (1839). Chevely; or, The man of honour. E. Bull, London, Volume 2, page 106. In Chapter 3 of Charles Dickens's Bleak House (1852), when Esther arrives in London, she asks of the person meeting her "whether there was a great fire anywhere? For the streets were so full of dense brown smoke that scarcely anything was to be seen. 'O, dear no, miss,' he said. 'This is a London particular.' I had never heard of such a thing. 'A fog, miss,' said the young gentleman." The Arthur Conan Doyle Sherlock Holmes stories describe London fogs, but contrary to popular impression the phrase "pea-soup" is not used; A Study in Scarlet (1887) mentions that "a dun-coloured veil hung over the house-tops. "; The Adventure of the Bruce-Partington Plans (1912) describes "a dense yellow fog" that has settled down over London, and later notes "a greasy, heavy brown swirl still drifting past us and condensing in oily drops on the windowpane"; while in The Sign of Four (1890), Holmes soliloquises; "What else is there to live for? Stand at the window here. Was ever such a dreary, dismal, unprofitable world? See how the yellow fog swirls down the street and drifts across the dun-coloured houses. ", and, later; "...the day had been a dreary one, and a dense drizzly fog lay low upon the great city. Mud-coloured clouds hung over the muddy streets." In the phrase "pea-soup fog," the implied comparison may have been to yellow pea soup: "...the yellow fog hung so thick and heavy in the streets of London that the lamps were lighted" (Frances Hodgson Burnett, A Little Princess, 1892); "The yellow fog that rubs its back upon the window-panes," (T. S. Eliot, The Love Song of J. Alfred Prufrock, 1917); "London had been reeking in a green-yellow fog" (Winston Churchill, A Traveller in War-Time, 1918); "the brown fog of a winter dawn" (T. S. Eliot, The Waste Land, 1922); "a faint yellow fog" (Stella Benson, This is the End). Inez Haynes Irwin, writing in The Californiacs (1921), praises what was then the superior quality of California fog, saying it is "Not distilled from pea soup like the London fogs; moist air-gauzes rather, pearl-touched and glimmering." A Foggy Day, originally titled A Foggy Day (In London Town), is a song composed by George and Ira Gershwin to set the mood for the 1937 film A Damsel in Distress. The fog plays a role in Michael Crichton's 1975 novel The Great Train Robbery "On the evening of January 9th, a characteristic London “pea-soup” fog, heavily mixed with soot, blanketed the town. Clean Willy Williams, easing down Tooley Street, one eye to the façade of London Bridge Station, was not sure he liked the fog. It made his movements on the ground less noticeable, but it was so dense that he could not see the second story of the terminus building, and he was worried about access to the roof." (p.124). In the animated television Christmas feature Rudolph the Red-Nosed Reindeer (1964), the characters Rudolph, Hermey and Yukon Cornelius are travelling through a thick fog when the following exchange takes place: Yukon Cornelius: "This fog's as thick as peanut butter!" Hermey: "You mean pea soup." Yukon Cornelius: "You eat what you like, and I'll eat what I like!" The second chapter of the book The Woman in Black (1983) by Susan Hill is titled "A London Particular" and mentions the thick, dense fog of London, which Arthur Kipps witnesses on his journey to work at his solicitors' office. Sections of London Below in Neil Gaiman's 1996 novel Neverwhere are still affected by "pea soupers", remnants of the thick fog in London's past that got trapped in London Below and remained. In the book Un Lun Dun (2007) by China Miéville, the London Fog takes on the role of villain: the "Smog" of UnLondon. The Clean Air Act is misheard as the Klinneract. In "Act of God", Season 1, Episode 4 of the Netflix series The Crown, the events of the 1952 fog-deaths and their political ramifications take up the whole of the episode. ^ P. Brimblecombe, "Industrial air pollution in thirteenth century Britain", Weather 30:388(1975). ^ Cantril, T.C. (1914). Coal Mining. Cambridge: Cambridge University Press. pp. 3–10. OCLC 156716838. ^ Calendar of Patent Rolls, 13 Ed. 1.ml8d. ^ Landsberg, Helmut Erich (1981). The urban climate. Academic Press, New York, p.3. ^ B. Luckin, "Pollution in the City", in M. Daunton (ed.) The Cambridge Urban History of Britain, Volume III 1840–1950. Cambridge: Cambridge University Press, 2000, pp. 207–28. ^ Brimblecombe, P. (2006). "The clean air act after 50 years". Weather, 61(11), 311-314. ^ a b Fouquet, Roger; et al. (June 2001). External Cost and Environmental Policy in the UK and the EU (PDF). Imperial College Centre for Energy Policy and Technology. p. 18. ISBN 1-903144-02-7. ^ David Urbinato (Summer 1994). "London's Historic "Pea-Soupers"". United States Environmental Protection Agency. Retrieved 2016-05-08. ^ HTML text of Fumifugium. ^ "He shewes that 't is the seacoale smoake That allways London doth Inviron, Which doth our Lungs and Spiritts choake, Our hanging spoyle, and rust our Iron. Lett none att Fumifuge be scoffing Who heard att Church our Sundaye's Coughing." from; "Ballad of Gresham College". Original text. ^ Bell, Michelle L.; Michelle L. Bell; Devra L. Davis; Tony Fletcher (January 2004). "A retrospective assessment of mortality from the London smog episode of 1952: the role of influenza and pollution". Environ Health Perspect. 112 (#1): 6–8. doi:10.1289/ehp.6539. PMC 1241789. PMID 14698923. Archived from the original on 2008-10-14. Cavert, William M. (2016) The Smoke of London: Energy and Environment in the Early Modern City. Cambridge University Press. New York Times, April 2, 1871, pg. 3: "London... fog the consistency of pea-soup..."